Workday: Cove Point Light Station April 18, 2015 – Chesapeake Chapter U.S.L.H.S. It was a small crew that turned up for a picture perfect day at one of the prettiest sites on the Chesapeake. 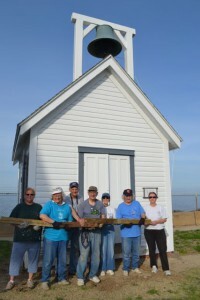 We met the Calvert Marine Museum’s Curator of Maritime History Richard Dodds at Cove Point Light Station under bright blue skies and a nice breeze off the bay with temperatures in the sixties and climbing. We talked for a few minutes and then got instructions on our tasks for the day. 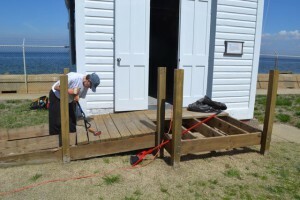 The biggest job was to take down a ramp leading up to the bell shed. 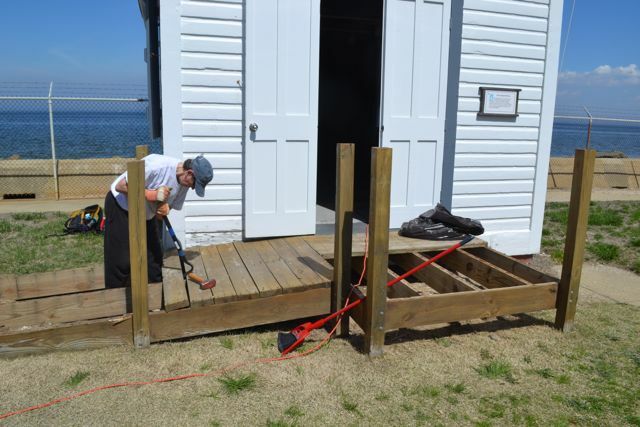 The shed no longer houses a video presentation for visitors and the ramp needed to be removed. Other tasks included cleaning the mildew off the ceiling of the bell shed where water had leaked in, scrape and paint the bell shed floor, sweep the lighthouse steps, paint the door to the tower and, if time allowed clean the porches of the rental units. Or initial crew of six got to work. As the day wore on and the temperature rose, we took off our jackets and sweatshirts. 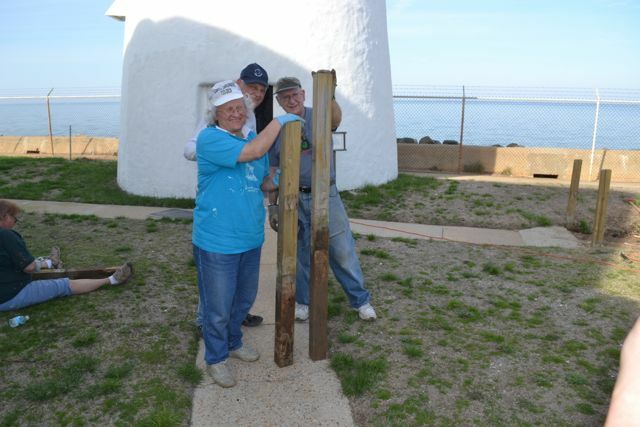 Quick work was made of sweeping the tower steps. The mildew was cleaned off the ceiling of the shed while the floor was being scraped. 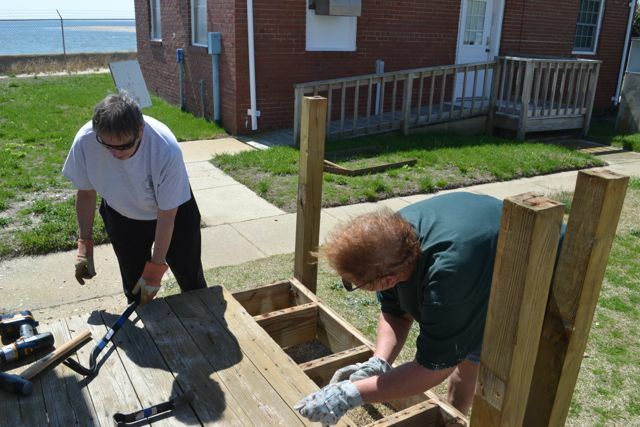 The ramp was quickly stripped of the railings and then volunteers attacked the ramp flooring. 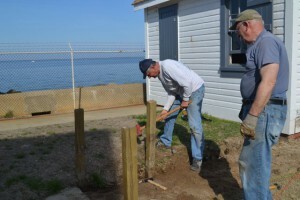 The ramp, constructed in 2004 as a Boy Scout project, was very well constructed. Removing it took quite a while. As other tasks were completed we all joined the de-construction crew. 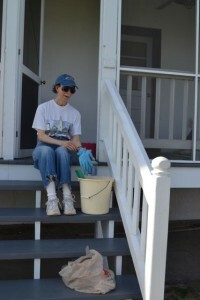 In the afternoon, we were joined by two more volunteers which was exactly what we needed – we were running out of steam. The final post was pulled up around 5PM to a round of applause. We filled in the holes left by the railing posts, cleaned up and tired but content we headed home. Carolyn Dodson and Joan Spiece removing platform. 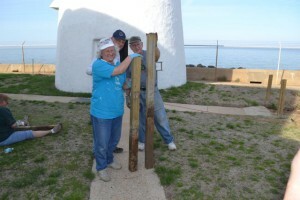 Lauren, Gerry and Tony with posts removed. Tony taking out his frustrations on the post. 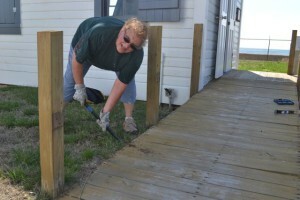 Carolyn removing boards form ramp. Joan Spiece pulling up boards. 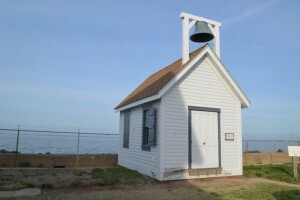 Bell Shed after ramp removed.